The OCS is delighted to present an exclusive guided exhibition viewing of Sincere Brush: Works of Ting Yin-yung Courtesy of His Students and Friends in the Department of Fine Arts, CUHK with Dr. Phil Chan the day before the exhibition closes. As a bonus members will also have one of the first opportunities to see Refilling the Interregnum: Newly Discovered Imperial Porcelains from Zhengtong, Jingtai and Tianshun Reigns (1436-1464) of the Ming Dynasty, which opens on the 1st of September. Following the viewing there will be a symposium on the excavated finds exhibited in Refilling the Interregnum. Members are welcome to remain behind and attend. Details forthcoming. Sincere Brush features seventy-four works donated by Ting Yin-yung’s (Ding Yanyong) former students and friends at the Department of Fine Arts that were composed between 1962 and 1978, and spanning the sixteen years when Ting was a faculty member at the Department. Eleven of the works on display are on loan. The majority of these works are demonstration sketches made during his classes, which showcase a wide array of emotions, alongside personal affections and wishes for his students and friends. 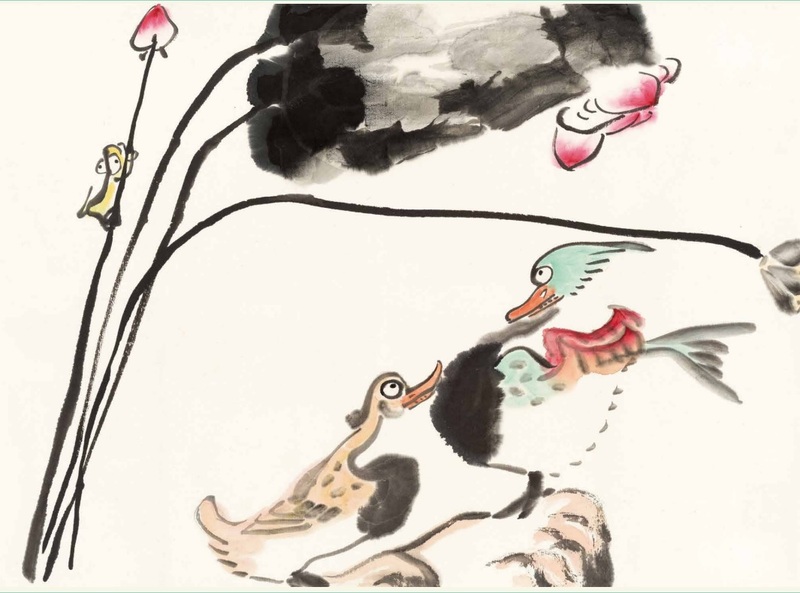 The exhibition is sorted into two phases and divided into seven sections: ‘Aquatic Lives’, ‘Flowers, Fruit and Insects’, ‘Birds and Land Animals’, ‘Four Elegant Plants’, ‘Figures and Landscapes’, ‘One-Stroke Paintings’ and ‘Calligraphy’. From the works one can accurately map the trajectory of Ting’s artistic creation and development during his later years. His artwork is notable for his expressiveness, and delightful play with time-worn subjects executed with ‘simple child-like’ brushstrokes. To read more about the exhibition please click here. Dr. Chan Kwun Nam, Phil received his Ph.D. from the Department of Fine Arts, The Chinese University of Hong Kong (CUHK). He is currently the Research-Assistant Curator (Painting and Calligraphy) in the Art Museum, CUHK. His research interests include Ming, Qing and Modern Chinese calligraphy and painting, the relation between Chinese poem and painting, and the history of connoisseurship and collections. He has curated several exhibitions, and edited numerous catalogues. His recent research focuses on Lanting artifacts and works of Dong Qichang in the collection of the Art Museum, CUHK. He was selected as a J. S. Lee Memorial Fellow, and will carry out research at the Princeton University Art Museum (New Jersey, U.S.A.) in 2019. The exhibition closes September 2, 2018.